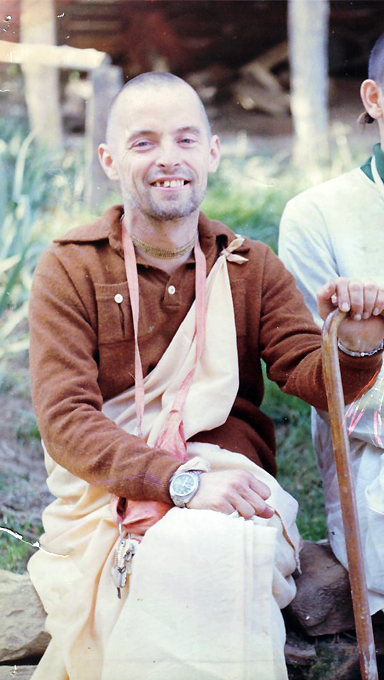 Swami Bhaktipada (1937-2011)—also known as Kirtanananda Swami—was the charismatic and highly controversial Hare Krishna guru who established in 1968 what became the largest Krishna community in the United States. The son of an Upstate New York Baptist preacher, Bhaktipada (then Keith Ham) met Swami Prabhupada (1896-1977), the Indian guru and founder of the International Society of Krishna Consciousness (ISKCON), in 1966 and became one of his first American disciples. During the 1970s and early 1980s Bhaktipada was recognized as a key leader of the movement and, after Prabhupada’s death in 1977, became a guru in his own right. At New Vrindaban, Bhaktipada presided over the construction of the opulent Palace of Gold, billed as “America’s Taj Mahal”—a memorial shrine for Swami Prabhupada dedicated in 1979—which became the second most popular tourist attraction in West Virginia. In 1987 Bhaktipada was excommunicated from ISKCON “for moral and theological deviations” after he became a prime suspect in a conspiracy involving the murders of two dissident devotees who had threatened to reveal his secret involvement in sexual child abuse. He refused to step down as the leader of New Vrindaban and formed his own splinter movement separate from ISKCON. In 1996 he pleaded guilty to a federal racketeering charge, was fined $250,000 and sentenced to twenty years in prison. He was released after only eight years due to poor health and spent the last eight years of his life in New York City and India. Despite his expulsion from ISKCON, his criminal conviction and sexual deviance, Bhaktipada is still worshipped by hundreds, if not thousands of followers in India and Pakistan who consider him a “holy man” and follow his teachings as promulgated in his two dozen books. Bhaktipada is a study in contrasts: he is adored as a saint by some and reviled as a psychopath by others. The author will attempt in this biography to reveal the many sides of his complex personality. Chapter 1: This child will be a great preacher. The Murder of Sulochan (Steven Bryant).